This month we are in for a real treat! 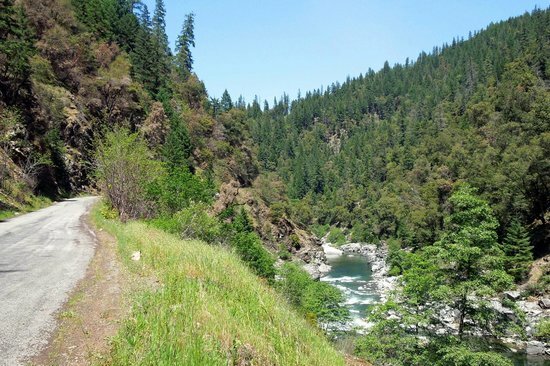 Riding and camping in this part of Northern California offers riders some of the best roads and scenery in the state. And the rugged beauty of the Forks of the Salmon is hard to beat!As an added treat, we will be touring through the Avenue of the Giants. You've got to see these trees to believe just how mammoth they really are. And speaking of mammoth, we will also be traveling through bigfoot territory so keep your eyes peeled! Considering the distance for this ride we're moving breakfast and the departure time up 30 minutes. So breakfast is at 7:30 AM at Adel's in Healdsburg and the ride departs at 8:30 AM. Lunch: The Eel River Brewing Company in Fortuna. Grocery stop in Arcata or at a well appointed market in Somes Bar, 10 minutes from the campsite. The campsite is dry, bring or plan to buy water.